Last night I hosted a horror movie night for some lovely fiends where we watched a double-feature of Leprechaun and April Fool's Day. It was like a post-St. Patty's Day/pre-April Fool's Day themed night! I wanted to make a green main dish for the night in honor of the theme, so I decided to make vegan spinach dip and some Irish soda bread to go along with it. I had never made either dish before, so I was excited to try them out. First, I made Irish soda bread, which was super-easy to make! I used the recipe below, which I've had for quite some time and unfortunately don't have the source for. I think it is a pretty generic veganized recipe, though. 1. Preheat the oven to 425 degrees and line a large baking sheet with parchment paper. 2. Combine the non-dairy milk and apple-cider vinegar in a small bowl and set it aside. 3. Mix the flour, baking soda, and salt into a large mixing bowl. Form a well in the center, and add the non-dairy/vinegar mix, stirring with a large spoon until the mixture forms a dough firm enough to shape into a ball. If the dough is too dry, add a few extra splashes of non-dairy milk. 4. Place the dough on the parchment paper and form into a circle 8 inches in diameter and about 1.5 inches thick. Using a knife, make three vertical cuts into the top, .5-inch deep and about 2 inches apart. Then, crisscross with three horizontal cuts abut 2 inches apart. 5. Bake the bread 40 to 45 minutes or until the bread forms a golden brown, firm top and bottom crust. Best served warm! Mmmmm this bread was super-easy (no yeast! and it doesn't need to rise!) and super-yummy!! Not only was it delectable with the spinach dip I made, but this morning I had it slathered with blackberry jam and it was nom-a-licious! I will definitely be making it again. Now, the vegan spinach dip was going to be a real treat...I can't tell you how long it has been since I had spinach dip since going vegan! Luckily, I found a recipe from Healthy Happy Life that resulted in a delicious spinach dip that is also significantly healthier than your non-vegan version.It definitely "fooled" my non-veg friends with its decadent (but still healthy) goodness! I have slightly altered the recipe, but all credit for the recipe and accompanying photos should go to Healthy Happy Life. A few hours before making, pre-soak your cashews in water so they soften up. If you don’t have time, you can do the “quick-soak” method 20 minutes before making – just soak the cashews in hot salted water. 1. Thaw your spinach. Do this quickly by soaking the bag in warm water. 2. Pre-heat oven to 350 degrees. 3. Add all your ingredients EXCEPT beans and cheese to a food processor. Blend until smooth. Then pulse in the beans. Do a taste test and adjust seasoning to suit your preferences (Kathy provides lots of optional seasoning “add-ins” on her blog, so check out the original recipe). 4. Pour the spinach dip into a heat-safe serving dish. Fold in the Daiya cheese. Then top with a handful of more Daiya cheese. 5. Pop in your pre-heated, 350 degree oven for 15 minutes. Once 15 minutes are up, turn the heat up to “Broil”, place the dish on the top shelf of your oven for 5 minutes so the cheese browns and bubbles and gets to that perfect ooey-gooey consistency. 6. Once the time is up, remove from oven and let it cool for a minute. Serve warm with the Irish Soda Bread (or with chips, crisps or veggies). 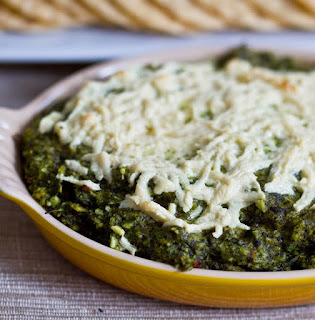 This spinach dip is filling, satisfying and oh-so mouthwateringly delicious! I definitely liked "tricking" my non-veg friends with this hearty but healthy spinach dip and serving it with the fresh-baked Irish soda bread. They were a perfect accompaniment to our cheesy horror movie double-feature. now both sound really rasty :-O guess i'll have to try it haha <3 thanks for sharing!